When you are young, independent and earning well enough, you feel invincible. There is a whole lot of time to think about the future, marriage, kids, house or retirement. While this is perfectly true there is another truth as well which is that money begets money. 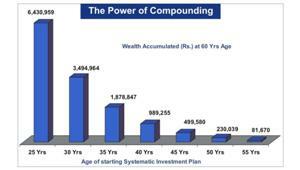 The sooner you start investing, the more time your money will have to grow with the compounding effect. Remember compound interest that we did back in school, it applies in real life too. Rs.100 that you invest today earns Rs.10 by next April, and by April 2015 you not only get another Rs.10 on the original Rs.100, but also get 10 percent on Rs.10 which is the profit for the first year. The profit from the first year also earns return thereon. Simply put, the law of compound returns says money left alone creates more money. 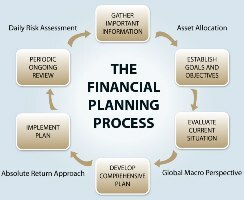 So this is what finance savvy people mean when they say I want my money to work for me! So if you put aside Rs.5000 a month, starting from your 35th birthday, then at the age of 55, assuming this investment grew by an average 8 percent p.a., your kitty would stand at Rs.30 lacs. But if you start the same exercise now when you are 25, then the same kitty at age 55, would amount to a whopping Rs.75 lacs. Do you see the difference starting 10 years earlier can make? Isn’t this reason enough for you to put aside some money starting now? So the Panchtantras, Aesop’s fables, Grandma’s tales, all knew what they were talking of when they preached that the ‘early bird gets the worm’. Now the next thing would be where to put this money every month? Friends, do remember that money also has to bear the effect of inflation over time. So the purchasing power of money gets corroded and you end up having to pay more money in the future for the same thing. So when you are considering options for investment, you need to see the real return of the investment, not just the nominal return (face value). The real return takes into account the effect of inflation. Which is why, there is nothing more criminal in personal finance than leaving money idle in bank accounts. You earn a simple interest of 4% on your savings account. So at the end of the year your Rs.100 has now become Rs.104. Meanwhile the inflation for the year has been a low 5 percent i.e Rs.104 is actually worth Rs.98.90 in today’s term after inflation. Which means your real return on the Rs.100 is not Rs.4 but instead there is a loss of Rs.1.20 because of inflation. If you put aside Rs.5000 a month in FD would amount to a whopping Rs.30 lacs, 50lac, and 75 lacs in a time span of 20, 25 and 30 years assuming this investment grew by an average 8 percent p.a. If you put aside Rs.5000 a month in GOLD would amount to a whopping Rs.50 lacs, 90lac, and 1.5 crore in a time span of 20, 25 and 30 years assuming this investment grew by an average 12 percent p.a. If you put aside Rs.5000 a month in EQUITY would amount to a whopping Rs.90 lacs, 2.2 crore, and 5.0 crore in a time span of 20, 25 and 30 years assuming this investment grew by an average 18 percent p.a. So you have to seek investments which help you beat the inflation and stay in the green!